Google Maps have become a ubiquitous part of everyday life in the modern age. Many consumers solely rely on the Google Maps app on their mobile device for their navigation needs. There was a time when business owners would give actual directions to their location, now, they are more likely to use an embedded Google Map. Google Maps may become more popular still if Google’s newest features take off. Google is introducing an updated “explore” feature with more detailed information about the locations found on Google Maps for mobile devices. 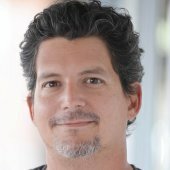 One of the benefits of Google’s massive amount of data from user reviews and data from mobile devices is that it has a good feel for the businesses in the area. They know what’s popular around what time, as was demonstrated by their new foot traffic feature. They also know the demographics of the people who visit certain locations. This makes Google the ultimate (if a little creepy) tour guide. With this new Google Maps update, Google can help people who are searching the map for “Lunch nearby right now” or “Best spots for dinner with kids this weekend”. This is substantially different from a traditional list of restaurants that search results would normally produce. Additionally, select metropolitan areas are getting some extra features included in their Google Maps explore update. New York City, San Francisco and London, will get curated recommendations from Google Maps for people searching in those areas. Each of these are huge cities with distinct neighborhoods and districts that tourist are known for visitings. .
Google Maps will help users in the area discover the unique things about the neighborhood. 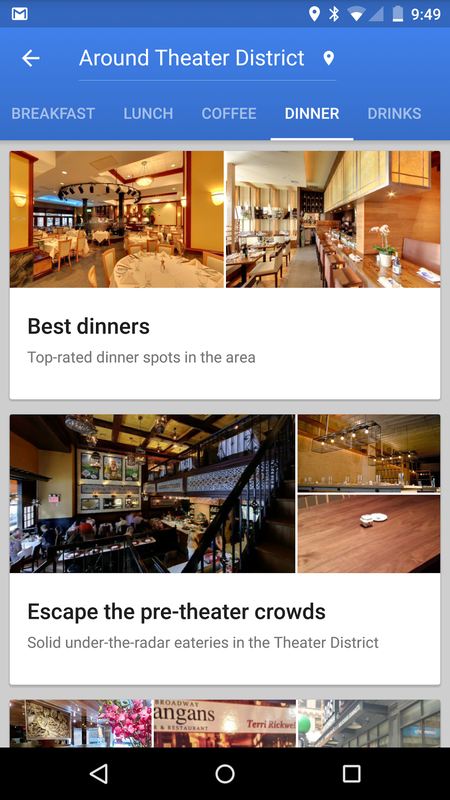 For example, Google said the updated map app could suggest pre-theater dining in the Theater District in New York City; Dolores Park picnic fare in the Mission in San Francisco; or centuries-old pubs in The City in London. With the new categories, users can quickly browse the locations in a neighborhood. Once a user picks the category on the explore tab they’re interested in, they’ll find in-depth details about each location. They can swipe through photos, get details based on data (e.g family-friendly location, quick bite, etc), and check out ratings and reviews from Google and other diners. For select spots,Google will give locations based on data from the searcher. 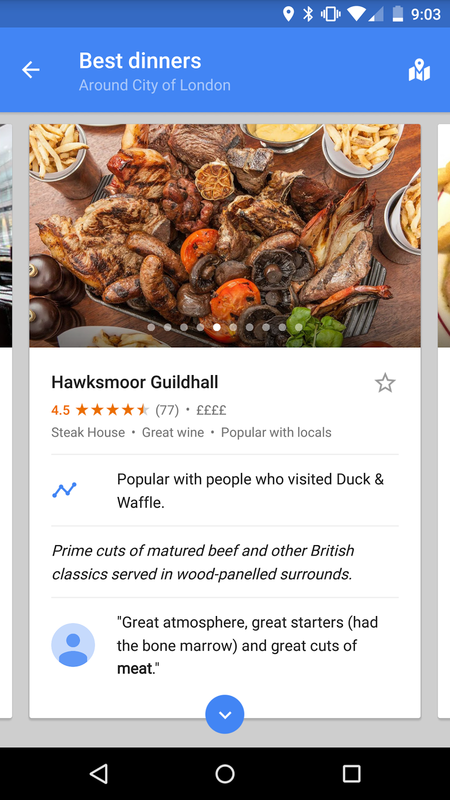 For example, Google Maps may recommend a place that’s popular with other diners who visited a place the searcher has been to in the past. It will be interesting to see how well these features are received. Consumers may be a bit concerned about how much of their data Google has and how they’ve chose to use it. For business owners and marketers, the best thing they can do with this information is make sure to keep their Google My Business profile up-to-date and continually post photos of food, events and so on. They should also encourage customers to like their Google My Business page and try to get reviews. The more data and content Google has to work with, the better they will be able to promote that business in the explore tab. A location that’s extremely popular based on foot traffic data but that has no online presence will probably get less billing than a moderately popular location that has a website, tons of photos and reviews. For more news about recent changes to Google, read this article about the recent changes to the Google Local Pack and what it means for small business owners.